Melbourne’s tram network plays a key role in connecting people to the places they want to go by providing a safe, sustainable, and inclusive travel option. Yarra Trams is also committed to extending our support beyond the rails and into the community we serve. We do that by building strong partnerships with community organisations that share our vision for a diverse and inclusive Melbourne. Read about the Yarra Trams Community Partnership program. 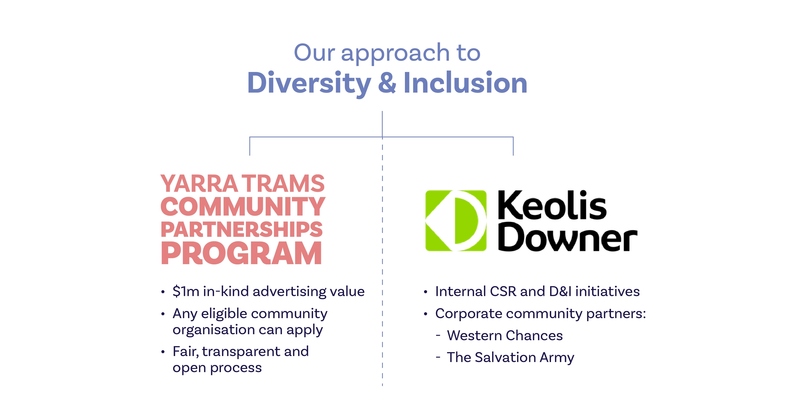 Read about Keolis Downer’s corporate community partners.